The snow is a marvel, and in Paris ~ is marvelous! This really is an exquisite shot. Great angle and monotone effects. Perfect! I love this photo! A very special snow pic. How generous of you to show us your friend's photo....it is a winner!!!!! Just so perfewctly beautiful. PS--I am still salivating over the thought of Thib's Christmas fois gras. Nice photo! Stuart, your friend, have a blog? Soon, monday 20, my wife and me will are in Paris, if the snow allow. Call me crazy, but I think I am about to leave the Australian sunshine and come to Paris to experience this beautiful Parisian winter wonderland. The thought of fois gras, truffle, red wine was tempting enough .... but this amazing photo nailed it for me! Thanks for your terrific blog and for sharing. Bonne Noel! I still can't overcome the nostalgia for my days in Paris, though I was there only a year. Paris covered in snow is just beautiful. Kudos to Stuart for capturing this image. I am so happy that you posted such a wonderful photograph. The beauty is just breath taking. Breathtaking!! Kudos to Suart. Will he let you put it on the calendar?! Alexa-I just saw your photo-its great! Eric - just looking at yesterday's photo again - is that you reflected in the wine glass?! PHX - I agree about Thib's treat - it sounds so intriguing! Wow, this is truly a winner. Such a beautiful scene. Oh WOW! Thanks so much to Stuart for this breathtaking contribution!! LOVE this picture. I wish I was there!! Simply awesome Eric and Stuart. Me thinks we'll have to get copywrite permission for the calendar and Christmas cards though! It is an honor and a privilege to share the stage for one moment with the master. I admit to being spoiled by living so close to the TE that I can dash over and catch her whenever conditions are right. I can’t tell you how many pics I must have. Anyway, my hat is off to Eric (and that’s saying something in Paris right now as it’s snowing yet again!) for his commitment and stamina in posting a thoughtful, well composed, and well researched photo EVERY day. Well done Stuart, that is a prize winning photograph! There's a saddness to it ............ like 'La tour eiffel' is fading or eclipsed by the younger trees of the foreground! Great photograph, your buddy should be proud of it! PARIS IS EVEN MORE BEAUTIFUL NOW! LETS COUNT THE INCHES! Well I see you've taken a cue from your fans and now you have greeting cards, a poster, iPhone cases, and even an iPad case on Zazzle! This is the most stunning photo I've seen for a long time. WOW ! kudos to stuart. this is a marvelous image. 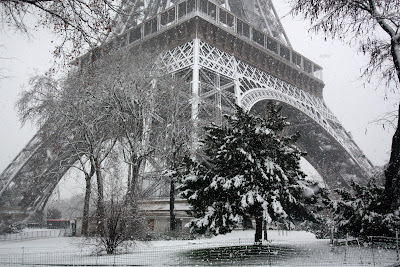 There is no city that is more beautiful than Paris in the snow. We, and our creations, are so small when Nature says how strong it is. Lovely photo. Regards and have a Merry Xmas Eric. Stuart you are indeed fortunate to live so close to her. This photo is stunning. Bravo!! This is spectacular!! This shot captures the atmosphere perfectly! Wow. Oh my! What a photo, and we are so lucky that Stuart captured this moment... I was fortunate to have snow on my recent trip which is much nicer than the rainy days in December. Snow in Paris is just icing on the gateau! Great job, Eric and Stuart! Oh wow. What a shot of the iconic Eiffel Tower! Absolutely stunning! A tip of the hat to your guest photographer Stuart. Lovely. So very kind of Stuart to allow you to share this with us. Definitely a Perfect Paris picture! It's just stunning Stuart and Eric. Stunning! I just found my new desktop background picture. Beautiful. Stuart lives in a fairytale! Gorgeous photo and as Lynn observed, it has a vintage look about it. Thanks for sharing it with us, Eric, and thanks to Stuart for allowing you to do so. Awwww... that's a beautiful shot!!! I know the snow is creating a bunch of problems for transportation agencies in Europe but it sure makes pretty pictures. Breath taking ! Please say 'merci !' to Stuart for us ! @gbailey, I'm guessing that Stuart is watching this box as the comments get near to 50!! BRAVO! Really lovely. I wouldn't mind having this on my wall. Not one bit! I missed this one, it is just fantastic. Lovely. Photographing only the base is more effective than I would have imagined. white + Metal = icy feeling! la question est : est-il possible qu'une photo avec la Tour Eiffel ne soit pas sublime ? J'adore ! One word "Wow". Just beautiful. I really love snow, can I have snowing on my place everyday ? Just one word to describe this picture. Fantastic! could i have this photo, thanks!